Welcome to the website of Apu Tour, the specialist in Peruvian tourism. Apu Tour was founded on respect for and curiosity about the many different customs and cultures in Peru. 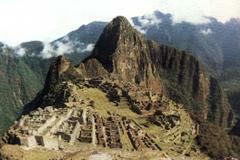 For the sixth year Apu Tour is successfully organizing tours through Peru. The last few years we have established a network of more than 350 contacts in Peru. Apu Tour is based in Arequipa. From Arequipa the individual traveler is guided and the group tours are coordinated. We can be of service from the most northern town of Tumbes, to almost 2,600 km southern in the town of Tacna. Would you like to go to Iquitos and take a boat to admire pink dolphins on the Amazon? Would you like a horseback riding vacation in the Sacred Valley of the Incas? A week to enjoy the nature in the Manu Biosphere Reserve? Or would you like to do our standard roundtrip with its diversity of options?